Written by chris maroulakos on Tuesday, February 21st, 2012 at 10:54am. 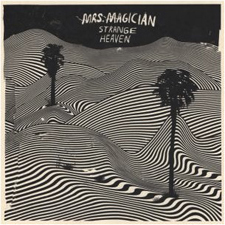 San Diego’s Mrs. Magician have announced the release of their full-length debut, Strange Heaven, on John Reis’ Swami Records label. The 13-track album — which was produced by Reis — will drop on April 17, but if you can’t wait until then, a digital download will be available beginning on March 6. In support of Strange Heaven, Mrs. Magician will be embarking on a cross-country tour with Cults, whom you might remember from our fancy Best Albums of 2011 list or the writings of lesser-known publications like Spin, Rolling Stone, Pitchfork, etc. The tour will begin on the East Coast and move west, but Mrs. Magician will actually play two San Diego dates: the first with Cults at the Belly Up on March 21, and the second with Reis’ band Hot Snakes at the Casbah on March 27. If you like good music, you’ll probably want to catch both shows. You can view the tracklist for Strange Heaven below, along with Mrs. Magician’s complete list of tour dates.